So there I was working on my Errands List when ny cellphone muttered. 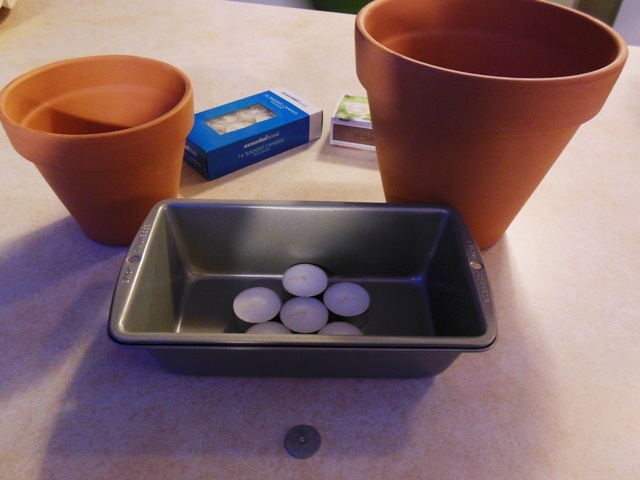 Neighbor Nannette was calling to say that she had acquired the flowerpot we needed for an important scientific experiment–and that she was going to make Reuben sandwiches for supper. Would I care to . . . ? I believe I was knocking at her door before she finished her invitation. I waste no time when excellent treats are in the offing. But first, our experiment. 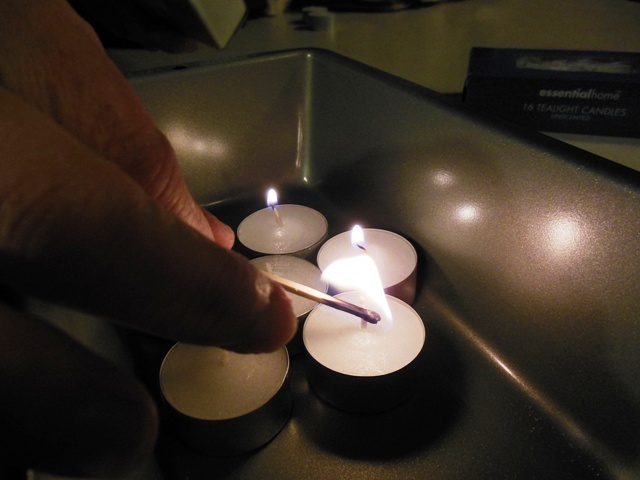 Nannette had been following an internet phenomenon about a handy emergency heater made from tealights and flowerpots. I know, I was dubious myself, but NN was not willing to let go of the idea without experimentation. We live in an area prone to winter power outages. Besides, even when we have power we are always on the lookout for frugal heat sources. Do you have any idea what propane costs this winter? I digress. When I arrived, the materials for our experiment were assembled. The idea is to put the tealights in the bread pan, light them . 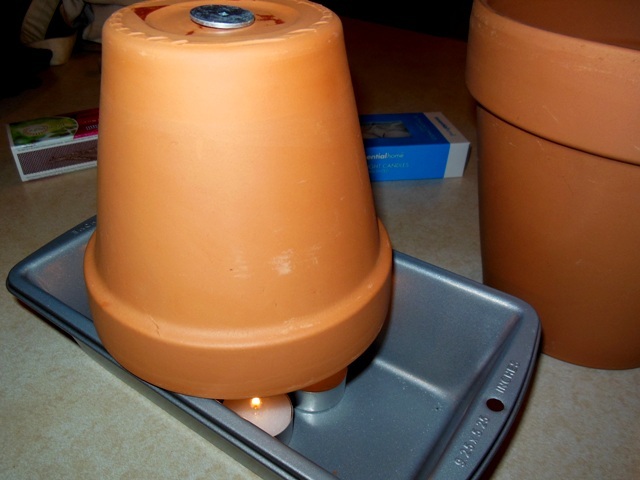 . .
set one flower pot over them to absorb the heat, adding that metal washer to keep the heat from dissipating before it warms the pot . . .
and finally adding the larger flower pot over the first one in order to make a sort of chimney. Voila. This is supposed to generate enough heat to warm a small room, or at least enough to keep a person from actually freezing to death before the power is restored. If you examine that last photo closely you may note evidence that wine was involved. This probably explains a lot. 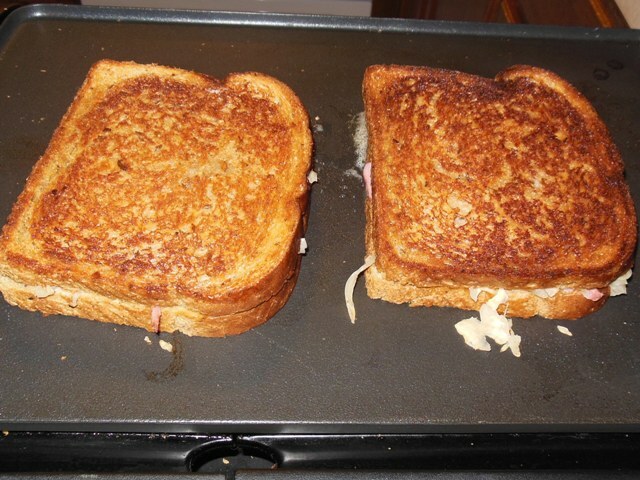 While we Awaited Developments, we turned our attention to the construction of the Reuben sandwiches. 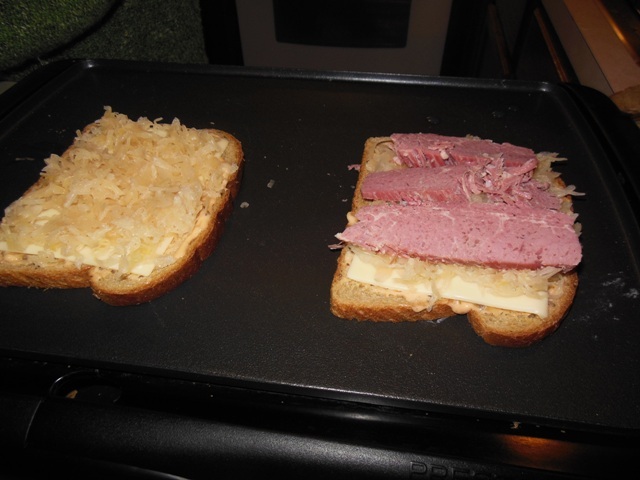 Butter rye bread slices on both sides, stack cheese, sauerkraut and slices of Nannette’s own corned beef brisket on top, cover with another slice of buttered rye, and grill until nicely browned – about the length of time it takes to have a little glass of wine. We ate the sandwiches (which pair nicely with coleslaw, should you be the sort of person who likes to matchmake for your food), drank more wine, discussed the major issues of the day, and then checked the heat output of the emergency heating device. Nannette believes it may have promise. I believe that at most it might heat the space under my desk – which would be a plus, as sometimes my toes get cold while I work. It might also be a minus, as I am both restless and forgetful, and I would truly hate to set my beloved wool slippers on fire. Nannette and I are in complete agreement as to the excellence of Reuben sandwiches on a cold day. This is the nice thing about having good neighbors. A person can almost always find areas of common interest. I have some more suggestions for winter preparedness, too. Wool socks. You cannot go wrong with really good wool socks. It was every bit as good as it sounded. So how many days have you had withOUT snow this winter? We were there Thanksgiving week, with seven, um, glorious days of blinding lake effect snow! Cannot wait to get back in the springtime. There have been quite a few days with hardly enough snowfall to mention, but the others made up for it. “And it’s co-o-old!” she whined. Oh wait, that was my ownself. Oh come on! I thought you were going to toast those sandwiches over the flower pot! I am dubious about the claimed powers of the magical flower pots – and certain that sandwich toasting isn’t among them.. The wool socks get my vote….and long Johns of course. Though wine as central heating works well (I am told). I had completely forgotten to list woolly underwear. The wine probably accounts for the lapse. Thank you for the timely reminder. Oh, my goodness. Those sandwiches make me wish I hadn’t had supper. Of course, I don’t have any bread, cheese, sauerkraut or corned beef brisket, but I’m sure I could make do somehow. The grocery’s only a mile away. Besides, I have the wine. Now the flowerpot fireplace? I wouldn’t even attempt that. I can see at least a half-dozen ways I could turn it into a catastrophe, and what I didn’t do, I’m sure the cat could. Then it would be a cat-astrophe for sure, and catching a cat with a flaming tail isn’t my idea of a good time. I’ll just go rearrange my grocery list for tomorrow. How nice to have nice neighbors. It’s a pleasure I’m without just now. The folks are nice enough. They just aren’t neighborly. You bring up an interesting consideration. Nannette has three cats, including Bear, who has a very fluffy tail indeed, and not a one of them showed any of the usual catly curiosity about our experiment. I have always been blessed with neighborly neighbors. Not all of them all the time of course – some people lack the neighboring gene – but a pleasant proportion. Scientific experiments involving wine and Reuben sandwiches, especially those that begin with step 1., Insert the Reuben sandwiches and wine into the scientist in the usual manner., are my kind of experiments. If a candle can heat a car caught out in the snow, it seems reasonable that a small herd of them might heat a small room, especially with the heat absorptive properties of terra cotta. And speaking of scientific discoveries, I discovered over the weekend that cousins I haven’t seen in a while mix well with coffee and my mom’s lemon bars. Now there’s a thought. I have cousins I haven’t seen in awhile, too, and there’s one in particular I’d like to entice to visit me. I wonder if coffee and lemon bars would do the trick. Isn’t it wonderful to have a friend like that who can spontaneously generate joy and good times with scientific fun and food? I’m thinking the flowerpot furnace may be one of those emergency efforts — but won’t, I think, replace the socks, cats, a good down comforter or a space heater! It is wonderful to have friendly neighbors. Nothing like good times to banish February blues. If I ever try the experiment at the Writing Studio and Bait Shop, I will be sure to report the results. I am considering some modifications. Oh wow…thanks for doing that experiment. I always wondered about those, but never got around to checking it out. I was pretty sure of the outcome, but good to have it scientifically proven 🙂 You used just the proper amount/kind of variables (wine and reubens). Good to know you are so busy helping man/womankind this cold winter! Keep up the good work! Thank you Wendi. You can always count on Nannette and me to evaluate these things objectively. She and I are both very curious. The title “Pots of Preparedness” made me think instantly about pots and pans filled with water against the possibility of a power outage putting the electric pump out of commission. I hurried over to say “Me, too!” and then saw you and your neighbor were up to something MUCH more creative. Yes, we do know the cost of propane this winter. So, should I go out and buy clay pots? Um, no. You should go out and buy a nice 5-gallon drinking water container and fill that up! I’m trying to add it up to see if I even have five gallons worth of pots and pans. Probably not. I keep gallon jugs of drinking/cooking water all the time, so generally have about eight of them stashed in the guest room next to my storage apples and storage potatoes. I filled my bathtub before the last hysterical weather warning, figuring that at least I’d have enough to fill the Duo’s water dish and to flush on an as-needed basis. Fortunately I do not have enough data for a sound scientific evaluation of this approach . 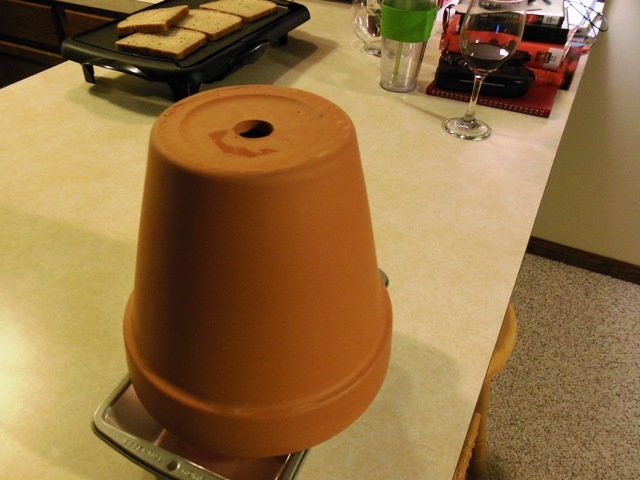 . .
Did the instructions for the clay pot heater specify which type of wine? Cause that might make all the difference. That and wool socks for sure. They did not. We improvised.